Chemistry is fundamental to our understanding of all branches of science and for a wide range of industries. 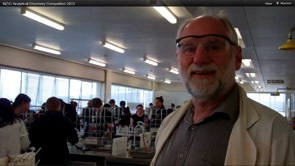 A degree in Chemistry from the University of Waikato means you'll gain an excellent grasp of Chemistry theory, supported by a strong emphasis on practical expertise. The structure of our chemistry major includes a range of highly theoretical, highly applied, quantitative and qualitative aspects. It will develop your analytical and problem-solving skills, which can be applied to many other disciplines. 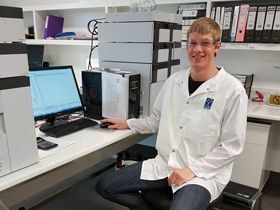 Accurate analysis of samples in the chemistry labs secured a win for four talented Year 13 students from Pukekohe High School. The team received first place at the annual NZIC Analytical Chemistry Competition, held at the University of Waikato. The competition challenged 96 enthusiastic Year 13 students from the Waikato/Bay of Plenty regions to spend a day in the university laboratories. Find possible career opportunities in chemistry. 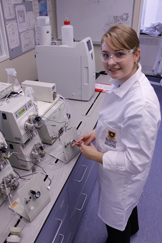 The Chemical Services Unit offers a multitude of services, completed using top-of-the-line analytical equipment. Check out the facilities & services on offer. Find out what's happening in the field of chemistry at the School of Science. Discover the research areas in chemistry at the School of Science.